This second trimester is flying by, and I think it's a combination of chasing a busy toddler and loving this stage of pregnancy. Yes being pregnant is more exhausting than not being pregnant, but it is just so nice to be able to eat food and not feel nauseous. 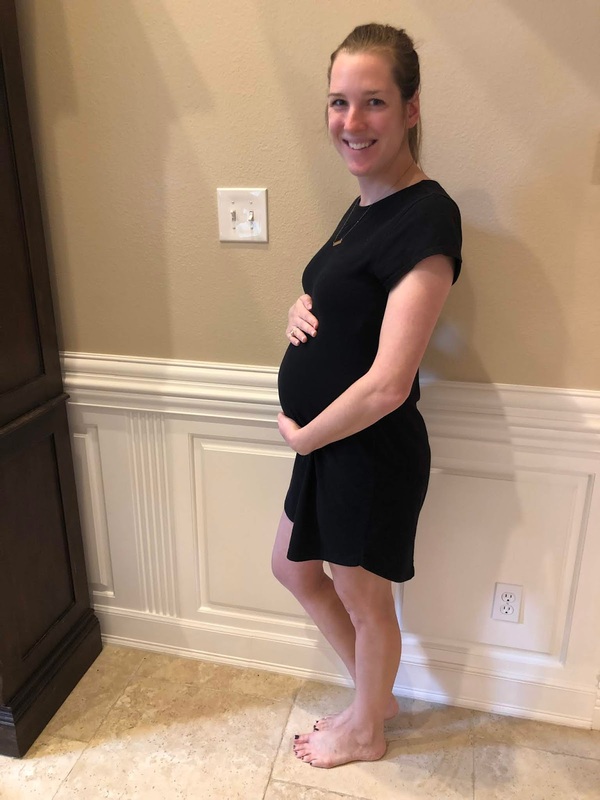 I get to feel kicks and eat a cheeseburger... life is good in the second trimester! The most exciting thing that happened this week was that my first niece was born! My twin sister had her baby, and meeting her with this little baby still in my tummy was amazing. It made me so ready to meet our baby! She is beautiful and perfect, and she and our son will be less than 5 months apart in age. I noticed this week that my belly button is completely flat. Bye bye belly button, see you... ? Parker and I can't believe how big my belly is getting (I don't know why we are so surprised... my belly was giant with Preston too!). I am feeling so many kicks and movements and love it so much. It feels amazing to be calling this baby by name. It was odd calling him by name the first couple of times I said it out loud because we struggled with his name for so long, but both Parker and I now call this baby by name at home and it feels so natural and so right. It makes things that much more real to know our son's name, and I really cannot wait to share it. The only other thing this week that stood out is the hunger. I have been so hungry! I eat every couple of hours and need more than just a small snack. I love big sandwiches, avocado toast, yogurt with granola, smoothies... the more filling, the better! So sweet! What did your sister name her little girl? Hope you have an awesome weekend! I really feel like your pregnancy is flying by! I am just so dang happy for y'all. Also, I'm with Jen, I feel like this is flying by for y'all! I can't wait to hear what his name is!